Jane’s first confession is that when choosing an instrument as a child, the flute was her second choice. Having watched the local orchestra where her father was principle violinist, she’d decided on the bassoon. However, a quick assessment of finances (bassoon vs flute) and it was established she would be learning the flute! It’s not a decision she regretted and at school enjoyed playing in her local youth orchestra, town band and a Saturday job as a student music teacher for Somerset Rural Music School. Later on, her father generously rectified the bassoon situation and she is now a member of Blowzone and regularly performs with Bude Concert Orchestra. For Jane the formation of Flute Cocktail was a wonderful opportunity to play flutes in a relaxed, friendly atmosphere. 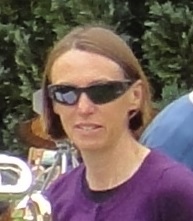 She enjoys the wide repertoire and the opportunity to play a range of flutes. Playing in the group gives focus to practicing and hopes the group tolerate her rather erratic attendances due to work commitments!